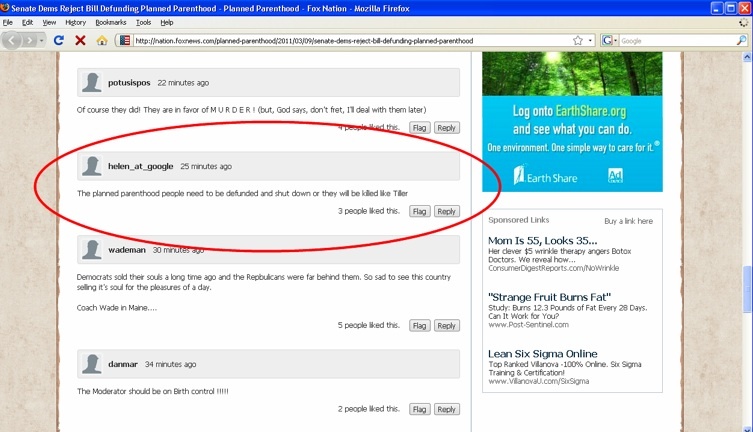 We can add Planned Parenthood workers to the list of people Fox Nation readers want to kill or be killed. We've already posted about how Fox Nation is the go-to site for those wishing for President Obama's assassination - as well as Al Gore, Nancy Pelosi, George Soros and more. Now, thanks to reader I.T., we find that Fox Nation has allowed a comment saying, "The planned parenthood people need to be defunded and shut down or they will be kílled like Tiller." That's bad enough but what's really damning is that five readers "like" that comment (so far) and that after 15 hours, it's still posted on Fox Nation.